Will you help us prepare for the next 20 years of resistance? Through collaborations with over 75 organizations and groups already this year, Critical Resistance (CR) continues to make abolition irresistible. We've done over 100 workshops and presentations this year to over 2,000 people—in just 6 months! We're inspired by the breadth of pro-Black, pro-migrant, pro-queer organizing happening across the country, and are humbly proud to be raising the banner of abolition as a necessary vision for change and concrete strategy for organizing. It's our 20th anniversary! 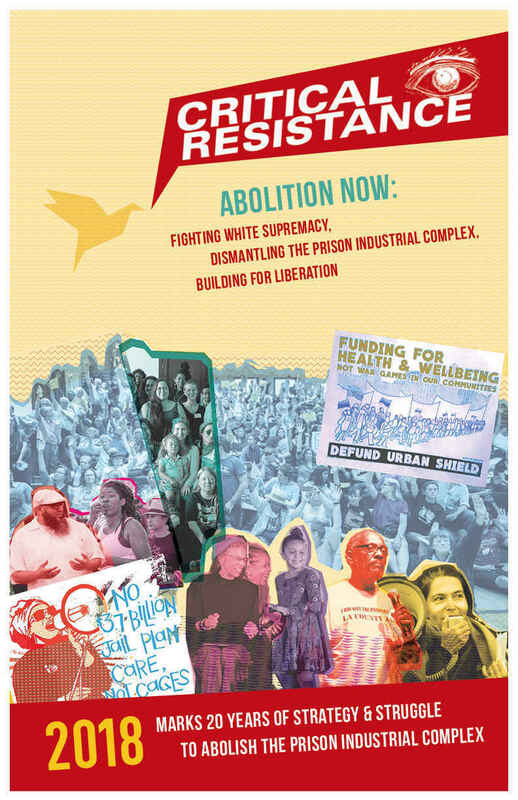 2018 marks our 20 years since the 1998 "Critical Resistance: Beyond the Prison Industrial Complex" founding conference. Two decades since the first call to "do Critical Resistance," the enthusiasm and demand for the vision and strategy of abolition is still strong and continuing to grow— with much thanks due to your humble and energizing support. Will you help us prepare for the next 20 years of resistance? With your help, we can continue to put abolition into practice in strategic and useful ways to fight back against the interlocking systems of imprisonment, policing, surveillance— what we call the prison industrial complex or PIC— that touch all of our lives. We are ready to infuse our chapters and campaigns with more power by adding two more full time campaign organizer positions, expanding our chapter meeting spaces, and training up our membership. CR chapters and members are building a movement to dismantle the PIC through strategic campaigns, creative projects, and political education events. Together, we challenge policing and imprisonment policies and fight the expansions of cops and cages. We create materials, event programs, and campaign demands that uplift young people, current and formerly imprisoned people and their loved ones, service and healthcare workers, civic professionals, and communities working to create health and safety in their neighborhoods. These groups living on the on the frontlines of state austerity and repression know the problems and are therefore closest to making the solutions. Care Not Cops: Mental Healthcare Not Policing! CR Portland mobilized hundreds of people in Portland to testify and rally at two City Budget Forums to demand that the Mayor reject expansion of the Portland Police Department and instead fund robust mental health care resources and services without criminalizing contact. Following these powerful demonstrations, we uplifted community expertise and needs at our May 5 Community Town Hall with over 100 Portlanders representing 15 organizations, as well as mental health care workers and users..
CR Los Angeles hosted 4 workshops and listening sessions with service providers and community service users in Los Angeles to build expertise power and confidence for to fight jail expansion and demand Care Not Cages for the Reimagine109 campaign. We will amplify their expertise to advance the fight against jail expansion by demanding a divestment of $383 billion from the Sheriff's Department. Instead of cages and court strings CRLA wants an investment in community-based resources in health care and services rooted in community. CR Oakland and the Stop Urban Shield Coalition defeated Urban Shield, the international SWAT team training and weapons expo hosted by Alameda County Sheriff Ahern. While Urban Shield will still take place in 2018, the Sheriff will have to go to bat against the community in 2019 for how best to use emergency preparedness funds. We will use their last expo in September as an opportunity to deliver another powerful blow against the racist policing program by organizing a vibrant, internationalist weekend of resistance and keep pushing for emergency preparedness programs, not more police militarization. CR New York City joined forces with The Fortune Society and Creative Time to host 3 teach-ins at Bring Down the Walls, a school of radical abolitionist learning by day and house music club by night. Through storytelling of surviving and organizing against the PIC, sharing the vision and strategy of abolition, and talking about our Prisoner Correspondence projects and the Jail Free NYC effort, we made abolition practical and irresistible to hundreds of guests from all walks of New York. By amplifying visions of healthy communities without the PIC and shifting who is recognized as experts on policing and imprisonment, we strive to make abolition common sense, doable every day, and irresistible. Thank you for helping us create a new history, a new way forward, a renewed abolitionist vision and strategy for liberation. Twenty years ago, organizers put on a conference that sparked a renewed abolitionist movement and our organization. Their wildfire enthusiasm and readiness to dismantle the PIC got people lit. This year we want to add 2 staff organizer positions and advance our chapter campaigns. Will you help us keep the fire going? Please help us keep growing and building for liberation! Join us in continuing to build an abolitionist world into the 21st century. - Donate $20, $200, $2,000, or $20,000 for our 20th anniversary. Please support us by giving online or sending a generous check. - Become a monthly sustainer. Contribute $15, $25, or $50/month online or by check (some workplaces have giving programs!) to keep CR strong. - Subscribe or donate to The Abolitionist, our bilingual newspaper that we send to imprisoned people for free. Outside subscribers like you sponsor the readership of over 6,500 people inside prisons, jails, and detention centers. - Spread the word to family and friends and encourage people to support CR. - Host a house party, workshop or presentation to benefit CR and share our materials and vision. P.S. Your midyear gifts will help us add new staff and expand our work before this summer. Consider giving twice in 2018 for our 20 year anniversary, and make our work even stronger for the next two decades!